(4) Tomohiro Ishii & Toru Yano vs Lance Archer & Davey Boy Smith Jr.
~ Following the match, Archer declared that K.E.S will challenge for the IWGP Tag Championship. ~ Juice picks up a direct win over the NEVER Openweight Champion. ~ Suzuki continued to attack Naito after the match. ~ BUSHI and Hiromu brawled with El Desperado and Kanemaru after the match, until YOH and SHO came to the ring and attacked both teams. 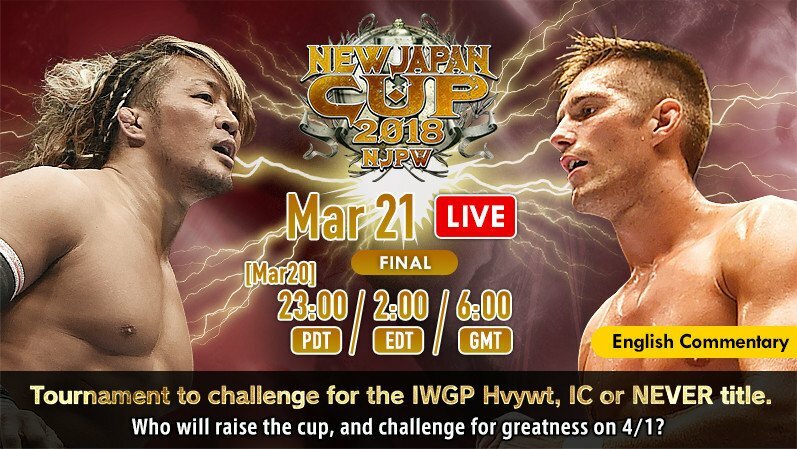 (8) New Japan Cup Finals Match: Hiroshi Tanahashi vs Zack Sabre Jr.
~ Zack Sabre Jr. wins the 2018 New Japan Cup, and said he wants to challenge Okada for the IWGP Heavyweight Championship. Okada accepted the challenge, and the match is set for Sakura Genesis on 4/1.